This year’s golf outing has special significance. FORE! the kids has grown to become Pathway’s largest fund-raising event, and we are proud to share that this year marks the 20th time the great game of golf has been used to advance our program. The combination of athletic prowess, confidence, friendship and generosity gathered together by foursomes over the past 19 years represents a force that is impressive. Rain or shine, the collective philanthropic dedication has generated over $1 million! 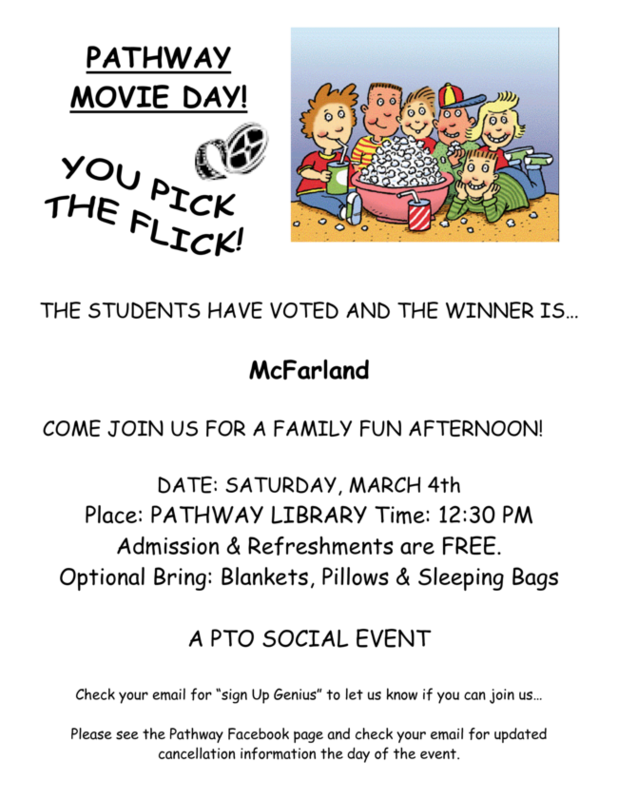 March 4th at 12:30 is the PTO Family Social Movie Day! Enjoy popcorn and a movie. The viewing of McFarland will be shown in SALC building at Pathway! 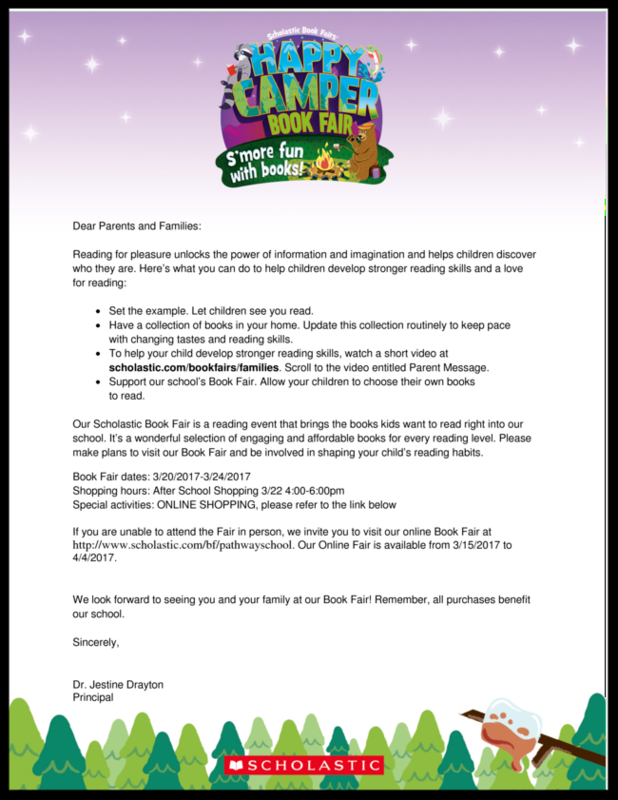 The Pathway School Book Fair is March 20th-24th! This year you will have the opportunity to shop after school and online! Missy Hawk has been an Instructional Coordinator for over 10 years, and is currently working with students in Pathway’s Transitional Living Program. In addition to academics at their functional level, students in this program learn important life skills, such as cooking, home management, budget planning and employability skills. 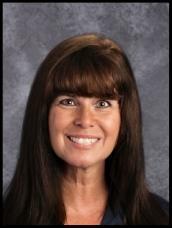 Ms. Hawk’s teaching style is energetic, creative, and captures the attention of her students, resulting in a positive learning environment. She knows the value of learning through realistic experiences and was instrumental last fall in planning a field trip to teach students how to use a voting machine to cast their vote during the November election. Each week her students work at Cabrini College and Ms. Hawk helps them to work efficiently and to represent Pathway through their interactions with each other and with the college students. Thank you, Ms. Hawk for your dedication, your positive energy and for always encouraging your students to be their personal best! 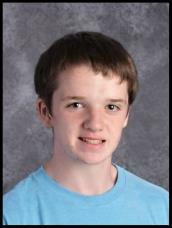 Colin Arnold has attended Pathway for 6 years He has strong motivation to excel academically and socially, and is willing to take risks, attempting assignments that are often new and challenging. Colin may have success on the first try, but if not he will persist until he realizes success! His varied career exploration includes shredding confidential documents for Pathway, care for the animals in a local animal shelter and maintenance & housekeeping work at Homewood Suites. His job coaches can trust him to be focused on his work and cooperative with his co-workers. Colin’s academic efforts were evident in a recent geography project assignment. For the 100th anniversary of our National Parks, students were instructed to choose 5 parks from a list of national parks within the United States. They were asked to answer questions about each park and create a google slide presentation, using 2 slides per park. One slide had the information requested, and the other slide had pictures of that specific park. The very last slide was if they were to choose one of their parks, which park would they visit, and why. It was very clear to Colin’s classmates and to the guests who came for his presentation, that he had earnestly researched each park and was enthusiastic about visiting if he had the opportunity. His presentation was organized, enjoyable and informative. Colin, we are so proud of your ambition and dedication to hard work and success! 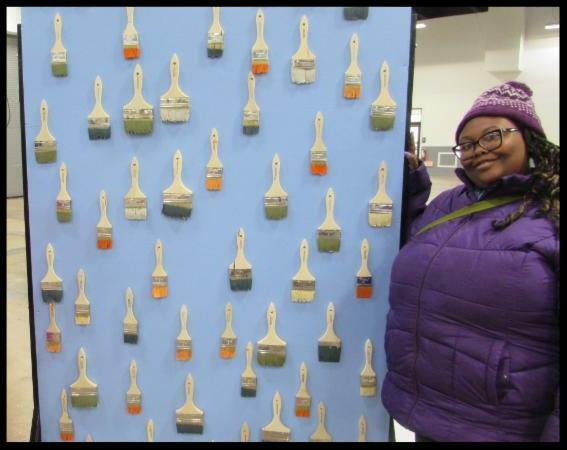 Pathway Students Create Whimsical Walls for Philly Home Show! The Greater Philadelphia Expo at Oaks hosted the Philly Home and Garden Show from February 17th – 19th. In conjunction with Pathway’s Career Education Program, nine of our upper school students were selected to participate in creating and constructing “whimsical wall” displays that were featured during the three day expo. Marketplace Events manager, Alyson Caplan provided the concepts for the various walls and our skilled students implemented the art. Five walls were constructed measuring 8’ high and 4’ wide and each with a different theme. The artwork was completed at Pathway and transported to the expo site, where the students assembled everything prior to the event opening. We are grateful to Marketplace Events for partnering with Pathway and offering our students this wonderful opportunity to discover new ways to showcase their talents and experience the benefit of team work. Global Tax Management (GTM) is the largest firm in the Mid-Atlantic region that focuses exclusively on delivering corporate tax services to mid-size and large multinational, public, and Fortune 500 companies. The company partnered with Pathway in 2016 when 25 of their employees volunteered their time at the school to do much needed painting and staining, landscaping and cleaning out several buildings on campus that will be remodeled for the new kindergarten program and eventually a pre-school program. Tax Manager, Matt McGlinchey took the lead on this project and subsequently felt the company could partner in another way. He and his wife attended Pathway’s Legacy Gala last November and sat beside the owner of Audubon’s Chick-fil-A. Much conversation centered on Chick-fil-A’s experience as a Career Education work site, and how this provides Pathway students with authentic work experience and prepares them for adulthood. Mr. McGlinchey advocated for the opportunity to create a new student work site and set the stage for a student to integrate into their Radnor headquarters. Pathway student, Shawn Luther, was selected to participate in this work opportunity and started with the company on February 14th. 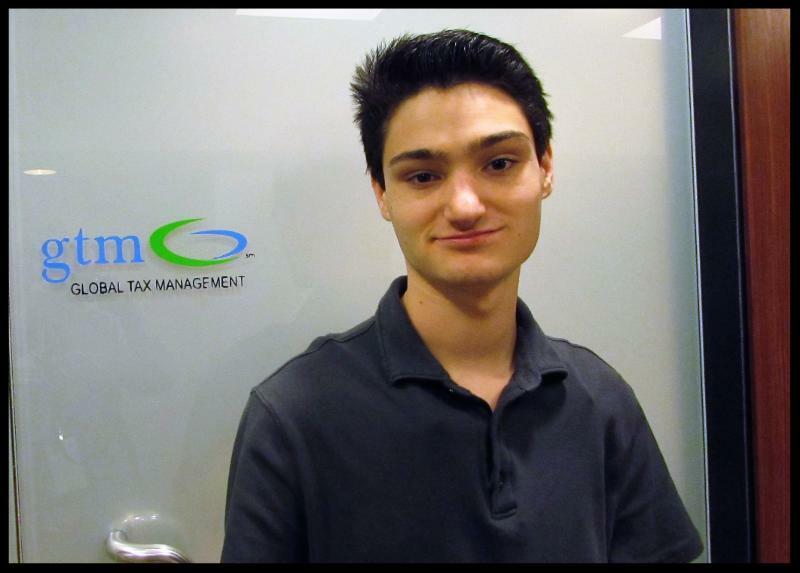 Shawn is working in the Radnor office 3 to 4 hours each Tuesday, assisting with document retention reports. This kind of community involvement provides valuable experience for our students that will only increase their value in the job market post-graduation. As this program develops we expect that additional students will be able to participate in this career building initiative. This, and all Career Education business partnerships, enable our students to have unique and meaningful career preparation. We are grateful for Global Tax Management and Mr. McGlinchey’s vision and commitment to our community. What makes a school environment a healthy one? A healthy school is a place where everyone feels accepted, appreciated, acknowledged, and cared for. This is the primary message 20 year old singer/song- writer, Stephanie Grace brings to schools all over Pennsylvania. 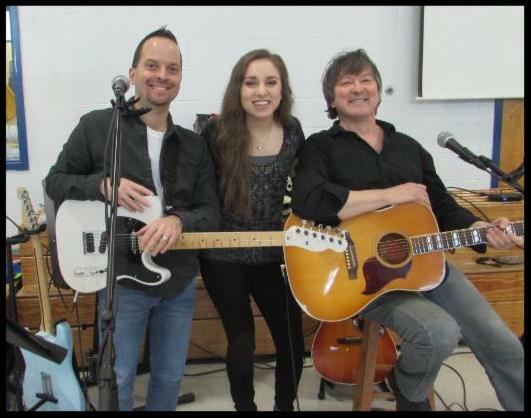 On February 14th Stephanie and two guitarists returned to Pathway with a powerful message of song and life experience. Through her singing and interactions with the students, Stephanie shared stories about her own issues with low self-esteem and how the power of positivity can affect a sense of well-being in ourselves and when shared, will bring joy to those around us. Stephanie’s vivacious personality energized the audience, as students asked questions and clapped to the music. This was truly an assembly to remember and to put into personal practice! Ms. Emily Marzewski knows first-hand the benefit music brings to a learning environment. As she was growing up, Emily felt music allowed her to express herself and have pride in creating something others enjoyed too. Ms. Marzewski wanted her students to also have this kind of experience. She decided to bring into the classroom instruments such as a guitar, ukulele, flute, piccolo, trumpet, an old Casio, and synthesizers. The class enjoyed creating new sounds with each instrument. As they collaborated with each other, creating an original piece of music, they learned the power of music as a form of expression and how it can unify a group. The class has also been learning about the influence of music in movies and video games and the effect it can have on our moods. 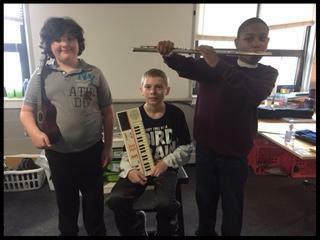 The students are recognizing that playing upbeat music can help us feel cheerful and more energized, while playing slower music with calming instruments, such as piano and violin, can create a relaxing effect during times of stress. The class is beginning to understand that different soundtracks can be used as coping strategies, which may help guide them through life’s ups and downs.